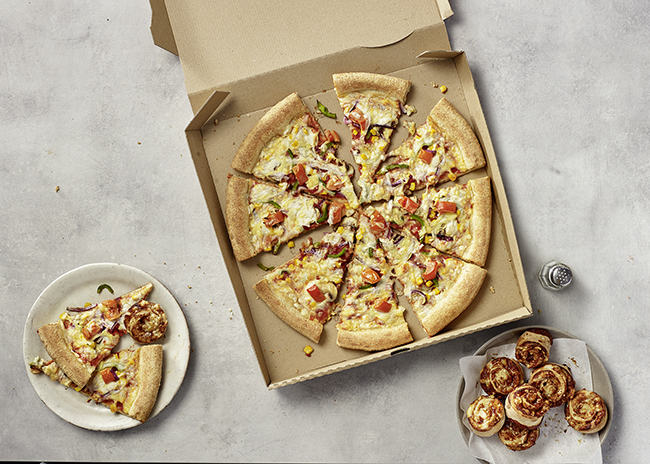 Takeaway pizza chain Papa John’s is launching a brand new vegan menu featuring three deliciously cheesy vegan pizzas and marmite and cheese scrolls. Pizza chain Papa John’s has confirmed it will be adding vegan cheese to its 350 plus outlets in the UK after a successful petition spearheaded by Animal Aid and Vegan Food UK received nearly 30,000 signatures. Papa John’s will be adding a delicious dairy-free cheese, ‘Sheese’, from award-winning brand, Bute Island to its nationwide menu in the UK. The tasty cheese alternative will be available on four of Papa John’s menu items, and the company has also announced that it will also be available on new products that will be launched in the future. Not content with releasing just one brand new vegan pizza, Papa John’s is adding three brand new cheesy vegan pizzas to its menu. Customers can choose from the classic and delicious, ‘Vegan Sheese and Tomato’, the fresh and colourful, ‘Garden Party with Sheese’ and for those looking to turn up the heat, ‘Hot Pepper Passion with Vegan Sheese’. Vegan pizza will be available nationwide from 28th January 2019. You can order online at www.papajohns.co.uk and directly via your local Papa John’s restaurant.